I attended Anime Expo for the first time, earlier this year. What struck me most at the convention was the number of fans and their high level of enthusiasm. Fans crowded in to see industry panels, but they also embraced fan-run presentations like the Old School Anime panel. 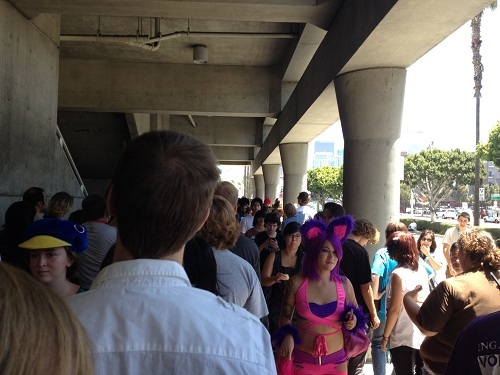 Based on the enthusiasm I saw, I’m not surprised that anime conventions are thriving right now. For example, Japan Expo is starting a new convention in California next year. Meanwhile, the industry is stagnating. Bandai folded last year. Media Blasters has canceled releases. Sentai and Funimation are battling in Federal Court. Why the disconnect between the health of the conventions and the industry as a whole? A cynic might say that you can pirate a DVD, but not a convention ticket. The real answer is that anime conventions give fans what they want, at the right price. It’s time for anime companies to learn to do the same. The piracy argument, that cons are succeeding only because they are immune from piracy, is misleading. It is true that fans can’t download conventions off the internet. Still, conventions do depend financially on sales of media and merchandise at the events. The piracy argument also obscures the bigger issue, which is why anime fans aren’t buying DVDs. It’s not that anime fans have no money, otherwise fans wouldn’t buy convention tickets. The problem lies with what anime companies are selling. People want to buy unique experiences. This applies to conventions. And it applies equally to DVDs. A DVD itself isn’t unique. It’s a mass produced, 50 cent piece of plastic. Something about the DVD needs to justify buying an object that will basically sit on a shelf collecting dust. How do anime fans justify buying a convention ticket? They are willing to buy tickers to have an amazing experience. 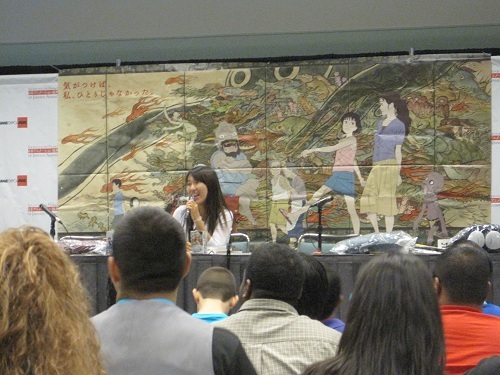 For example, fans can meet famous Japanese directors and voice actors and ask them questions. Fans at conventions also learn before anyone else what new shows are getting licensed. These once-in-a-lifetime opportunities make the price of a convention ticket worthwhile. NIS America and Rightstuff recognize the need to make releases special. NIS includes premium art books with its releases. Rightstuff provides books with interviews and liner notes to its Utena release. Those physical additions made the releases unique for me. I knew that the only way I could get the Utena booklets was to buy the box sets, so I bought them. The additions don’t need to be physical products. BD-Live provides a way for purchasers to access unique content online. Companies could reward fans with unique experiences like an online Q&A with the anime director. Or they could provide codes for additional content (like Hollywood does with digital editions) where the code must be used before a certain date. Anime companies need to get creative. They need to find a way to make buying discs special and they can do so by leveraging the web just as easily as by including physical extras. The industry needs to address the enthusiasm gap between con goers and DVD purchasers soon. Funimation, Sentai and the rest survive based on physical disc sales. Collectors drive those sales. Collectors, in turn, buy discs because they think they are valuable. That value comes from a secondary market for anime. Such a market might not exist, but the belief is enough to keep collectors buying anime. In the near future content viewing will shift from disc to digital. Digital licenses can’t (currently) be resold, and this will hurt collector interest. Anime companies will need to change their business model and convince a larger number of fans to buy anime. They will need to find a way to make anime unique and desirable. Otherwise, anime conventions and streaming sites will be all that’s left of the industry. Well, the problem is that the ACTUAL anime industry, the one in Japan, works just fine. Japanese fans are buying the discs, and the publishers are relying on them, so series are made with that budget taken into account. Compare to the video game industry that is switching from $60/game discs to the digital Free-to-play model with priced extras, but there they can also design new games and new genres to it, that can be made from the new model’s smaller budgets. But the current anime industry is in a situation that is more analogous to one country continuing to buy AAA games for $60, and everyone else expecting to get the same AAA games localized in a free-to-play model. The models of the two countries are simply incompatible. For the purposes of this post I was really talking just about the US anime industry, although it also likely applies to the western industry as a whole. And if recent incidents (like Bandai USA ceasing existence and Media Blasters struggling) are any indication, the US industry is still having problems. And if the US industry can barely get buy in a “free-to-play model” (or free-to-play in comparison to Japanese prices), who knows what will happen when the collectors propping up the US companies stop buying. The US industry is too directly connected to the Japanese one. If the Japanese collectors would stop buying, then the actual anime production industry could reorganize itself, focus more on lower-budget ONAs that could bring a profit from ads, merch, and source material promotion alone, and apply that same model in the US as well. But the US can’t apply this model on it’s own, while the Anime that they have to sell is still being made with a rich Japanese disc-sale industry in mind. I wouldn’t use conventions as a tell-tale sign about the industry. Cons offer meetups, panels, dealers, etc. Publishers can only offer one thing. The experiences are vastly different. This type of comparison doesn’t even have to apply to anime, it can be applied to the U.S comics industry as well. You have stuff like SDCC and NYCC which is a mass of entertainment and attracts hundreds of people. It doesn’t mean publishers like Marvel or DC are doing well selling their product. Also, two food for thoughts…AX is a major con. There will always be people for huge cons. But you won’t get the same numbers at other conventions, because not every con can get AX level talent to come. Second caveat: in Anime Expo, did you notice the number of cosplayers who happened to be dressed in stuff like Homestruck, which is based off a webcomic? Stuff like Adventure Time? I.E, yes fans will want to go to cons because it is cheaper and you can find things cheaper at a con, but let’s just say a good portion of congoers are not anime fans, they just want to either dress up, support a product that has nothing to do with anime, or is curious about the con experience. I did notice the homestuck cosplayers, although at first I thought they cosplaying as Control-C characters, until a friend clued me in. I see the homestuck cosplayers presence (assuming for the sake of argument that they were not anime fans) as validating what I said. Basically, the con is offering something so unique, so valuable that even people that are not anime fans thought it was worth money to attend. These non-fans get no value out of the anime directors. They get nothing from industry panels and what not, yet they paid the same cost of attendance as everyone else. The anime companies should be pulling out all the stops to convert these people into anime fans. They should find a way to appeal to people that want camaraderie as these Homestruck cosplayers do. And that’s not by selling .50 cent plastic discs. I disagree with you that publishers can only offer one thing. Publishers are certainly only offering one thing now, but that’s by choice. Disney didn’t feel constrained by being a publisher, it got wise and made its own con.